Obituary – Dillard, Elvenna Pearl « Perry High School Alumni Association, Inc.
﻿﻿— daughter of Mr. and Mrs. G. E. Dillard of Perry, was born in Perry on July 6, 1918 and attended the elementary grades in the Lone Elm school of Noble county and attended high school in Perry. Following graduation she expects to attend college although not immediately. 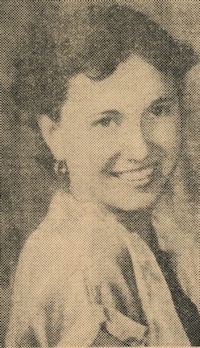 Elvenna Pearl Dillard, of Perry, Oklahoma. Age 92 years 4 months, 6 days died on November 12, 2010 at the Green Valley Nursing Home. She was born on July 6, 1918 in Perry, Oklahoma to George and Maria (Livingood) Dillard. Funeral services will be 2:00 p.m. Tuesday, November 16, 2010 at the Calvary Baptist Church. Rev. Roger Dunn will officiate. Interment will be in Grace Hill Cemetery. Services are under the direction of BrownDugger Funeral Home. Memorials may be made to the Calvary Baptist Church in care of BrownDugger Funeral Home, 1010 N. 7th Street, Perry, Oklahoma 73077. Elvenna is survived by two nephews, Dwaine (Vickie) Dillard of Perry, Oklahoma and Richard (Virginia) Dillard of Perris, California one niece-in-law, Gladys Dillard of New Germany, Minnesota two great nieces one great nephew three great-great nephews and one great-great-great nephew. She was preceded in death by her parents, George and Maria Dillard one brother, Basil Dillard and two nephews, Melvin Dillard and Larry Dillard.